Some other people I know of use their personal blogs to announce things. I, on the other hand, use mine to express my innermost thoughts. This may account for why not many people read my blog and a whole host of others read the more announcement based ones. This minor gripe aside, even I find myself stunned to read Anthony Rose announcing the launch of BBC iPlayer via mobile devices yesterday at 2.45pm. That’s around about the time I wrote and published this. Obviously Anthony’s announcement doesn’t include radio stuff but I’m sure it’s just a matter of time. Still, the apparent coiincidence is leaving me a little winded. Am I a mind-reader? Am I a mover and a shaker? Am I someone who gets under the skin of others? I may have to go and lay out in the sun to recover and consider these questions. Actually, I don’t need to consider these questions. I’m none of these things. I just rather like coiincidences. They set my pulse racing. It goes without saying that being on leave sunning myself in Turkey these past two weeks I was in no way involved in the iPlay-It-Again-on-portable-media-players project. I may just have to get myself a Nokia N96 now. Post-concert drinkies, originally uploaded by Thoroughly Good. What better way to listen to Beethoven 9 than splayed out on a sun lounger on the edge of an infinity pool at a German run hotel overlooking the Aegean? Think blue skies, a gentle breeze and no queue at the poolside bar for post-concert drinkies. I was listening to a recording of a live concert the BBC Philharmonic gave at the Bridgewater Hall on Friday 26 September, the Friday before I came away on holiday. Whilst I have been able to meet two of the BBC’s criteria for it’s content (finding and playing) I am, sadly, unable to meet the third – sharing it. The performance has missed it’s seven day window on the iPlay-It-Again thingy. Consequently you have only my word to go on. It was the first concert I’d listened to since the Proms, around about a month after I stood in the arena of the Royal Albert Hall listening to the Proms rendition. I was fighting to maintain my stamina in the last week of the season back then, conscious of some lower-back pain and irritated at the proximity of other concert goers. (It was late in the season.) I finished the performance that night hating Beethoven, the length of his final symphony and certain I’d never listen to any more Beethoven for as long as I could. I certainly wouldn’t be listening to any on holiday. Not so today. I sat on the toilet this morning browsing BBC Music Magazine and was reminded about the gig. I had a satellite recording of it on my laptop (it had taken quite a lot of fart-arsing around to get it from the Sky+ box to my laptop I might add). I’d listen to it this morning and see if I still felt the same way. Inevitably, the combination of seering heat and the stunning view added something to Beethoven’s monumental symphony. Not only that, the chance to listen to what sounded like an entirely different acoustic – Manchester’s Bridgewater Hall – was a bit of a treat too. The performance restored my faith in the 9th symphony. The third movement was especially glorious. It always takes me by surprise. I always think it should start slower than it invariably does. “Bloody hell, that’s cracking on a pace. Should it really be that fast?” The answer is clearly yes. It isn’t long before the third movement is underway that you’re lulled into it’s beauty. It set me thinking about something I’d quite like to see made available from the iPlayer thingyamy. In fact, if I could have a download manager installed on my portable media player then wouldn’t it be possible to impose some digital rights management on a WMA file thereby preventing me from distributing it and thus keeping all those legal types from going to an early grave? That way I’d be able to to it when I wanted, write yet another tiresome blog about what I’ve just listened to and (if it was available for say .. 14 days?) then share it? Four hours away from London and with only 48 hours left before I get home, I can’t help wondering whether all these “brilliant” ideas I’m having about iPlayer (let’s be honest – they’ve probably already been explored) may well have provoked some people at the Beeb to look a little more closely at the contract I have. Will I be finding a slim looking envelope on my doorstep when I push the front door open on my return? No! Of course not. That would never happen. Best prepare myself for the worst, just in case. 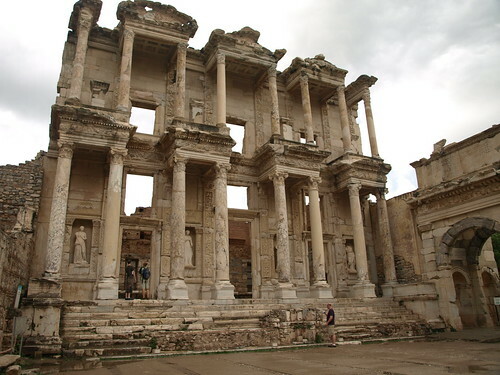 Library of Celsus, Ephesus, originally uploaded by Thoroughly Good. You know when you’ve been in a hotel a long time when you realise there’s been a change of staff at the breakfast buffet. People haven’t been fired – obviously – just that some people have got some time off and deservedly so. I’d noticed the same lack of familiar faces amongst the clientele too. All the usual breakfast grazers were nowhere to be seen. They’d been replaced by new faces, all of them very white, one of whom sat at the table across from ours running his finger over a guide book for Turkey. He seemed intent on planning how he and his American wife would crack the real Turkey. I’d reckoned on the same only the day before. I resisted the temptation. Let him find out the way I did. It’s the only way, I thought. As you see, I may have been on holiday for a week but there’s still a mean streak which needs to be worked on. There had been cloud cover across the bay only the previous morning. Despite Simon reassuring me that our closer proximity to the equator meant that some of that necessary UV could still penetrate the clouds and thus tinge our skin, I reckoned the fast approaching thunder cloud made a day at the hotel a miserable affair. It was time to explore. For some reason I plumped on Ephesus as the place we were going to visit. Ephesus was the oldest ancient site east of the Mediterranean. That meant old ruins. That meant sight-seeing. That meant a road trip. The journey to the ancient ruins would take us no more than an hour – an hour and a half at a push. This calculation based on me measuring the distance on the map from our hotel to Ephesus as being no more than half a forefinger. What I hadn’t bothered to check was the scale on the map. If I had then I later wouldn’t have been so inconsolably angry that our journey had taken two and a half hours. At that point there was at least another twenty-five kilometres to go. We finally arrived at the ancient site at around 3.20pm, having set off to avoid the impending rain storm only to drive through one at the beginning of the journey and arrive 188 kilometres just in time to get drenched in another one. The site closed to the public at 5.30pm. We’d have a couple of hours there before we had to drive back. This little road trip was feeling like a bit of a disaster. Ephesus wasn’t quite what I was expecting it to be either. I’d seen the pictures in the guide book. It made it look like a scene from Ecce Romani. I imagined a very British kind of tourist attraction with gift shops, printed tour guides, turnstiles and a cafe run by a couple of old women. Not so here. It may be an extremely important site, but such English details were lacking. We paid 4 YTL to get into the car-park only to be offered a free trip to the top of the site (the ancient city is effectively a walk down a hill – best to start from the top, not the bottom) by a man who spoke very good English and seemed to have a fantastic line in leather goods he reckoned we absolutely couldn’t do without. “First I take you to my leather shop and then I take you to the top of ancient city for free!” he said excitedly as he pulled the sliding door of his mini-bus wide open and ushered us inside. We declined, taking the shiny yellow taxi to the top for 15 YTL. We paid a further 10 YTL each to get in, at which point we understood why it was the guide books advised visiting the site when the sun was obscured by the clouds. There was no shelter which in turn meant there was nowhere to hide from the rain. Other visitors had taken the sensible precaution of bringing brollies and waterproof jackets. One foreign-looking couple who had found the only archway on the site to listen to their tape-recorded guide and wait for the rain to pass. Beside them was a brolly hanging from a hook in the wall. They appeared visibly unimpressed with British society as a whole when I ventured, “Is that brolly yours?” “Yes,” was the couple’s stern reply. For all my apparent moaning about the day (the rain did eventually stop), there was something eerily moving about the entire place. The Greeks obviously knew how to lay out a city in a suitably grand style. There was detail in the carvings, solidity in the stone walkways and an undeniable sense of grandeur in the buildings implicit in the remains which marked out foundations and boundaries. Looking down on the site felt a bit like looking at a partially completed cartoon. We saw the sketches of the buildings in front of us, leaving us the fill in the rest in our imagination. The more I looked, the more I wanted the site finished off. The more I wanted to wander around these amazing structures and live the glamorous life of togas and scrolls and sandals I reckoned it was back then. At the same time it felt odd to be wandering aimlessly over what at times felt like a forgotten town. People lived and worked and studied in these buildings how ever many hundreds of years ago. The idea the place had ceased to be vibrant and successful when the nearby port finally silted up, made what was left almost like a tomb. Stunning to look at, it did kind of feel as though we should have been marvelling from afar rather than clambering all over it. Fried Fishy Grub, originally uploaded by Thoroughly Good. It’s never great to be reminded of work when one’s on holiday. I tried to overlook the first sighting. I hadn’t slept very well yesterday morning; woke early; went to the gym; used the ski-machine with the embedded TV screen; the only usable channel was BBC World. But this afternoon’s reference was a little more difficult to avoid. 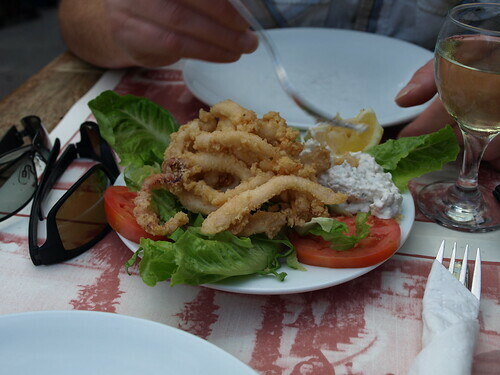 Sat next to Simon and I as we tucked into some fantastic fried calamari at Sunger Pizza in Bodrum was a smashing lady called Kim. Former UK-resident Kim now worked for a yacht charter business, the offices of which were situated conveniently above Sunger Pizza hence the fact she was sat at the table next to ours enjoying a post-work beer. Kim hadn’t been back to the UK for 9 years and had lived and worked in Bodrum for nearly twenty. “Oh, well you can always dip in to what’s going on back home via satellite TV, can’t you?” I pointed out recalling a friend’s parents having British satellite TV in their villa in Spain. “We get BBC World and BBC Prime. The choice is limited,” Kim replied sipping her beer. “Well there’s always the iPlayer,” said Simon. “What’s the BBC iPlayer exactly?” asked Kim looking slightly confused. It seemed almost impossible to believe that a British citizen wouldn’t know about the BBC iPlayer. I resisted the temptation to quip “it makes the unmissable unmissable.” If she didn’t know what the product was she was hardly going to know what the advert was. Had I not finished eating I almost certainly would have choked when I heard this. So, keen to draw the conversation about the BBC to a close (and thus avoid any attention being drawn to the fact that I work there – people do always assume that you’re able to sort out any problem with the corporation be it something on the Archers or the colour of Huw Edwards’ tie), we paid our bill and got up to leave. I made a mental note to kick-start another discussion when I got home about British ex-pats having the opportunity to subscribe to BBC iPlayer content. At this stage I don’t know of anyone I can pester at BBC Worldwide to get it sorted out. Give me time though, give me time. This is a Coffee and Tea Maker, originally uploaded by Thoroughly Good. I am exactly the kind of stereotypical British holidaymaker you could expect to find far from home staying in a luxury hotel. In fact, I’m exactly the kind of holidaymaker who’d drive you wild with irritation. I can’t abide being ripped off. I’m suspicious of it. I’ll sniff it out and kick up a fuss when I’m certain it’s going on. Take yesterday. Simon and I return from the pool for our now regular late afternoon cup of tea on the balcony. 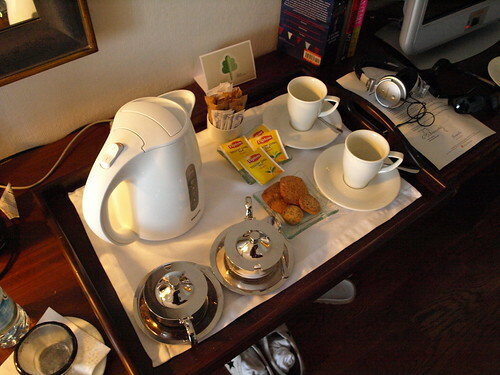 I’ve already asked for a “Tea and Coffee Maker” from housekeeping knowing the kettle, teabags, milk, coffee and sugar don’t need to be signed for. It’s free refreshments. Perfect. Only there’s a problem when we get back to our room. We’ve run out of teabags. Calamity. It’s OK, I think. I’ll just ring reception for a handful of replacement teabags and some more milk. “That’s fine sir. I’ll get that sent up to the room for you,” said the friendly lady with a slight American twang to her voice. When the chappy arrived with a sparkling jug, two tea bags on a glass dish, a couple of biscuits and a receipt to sign I immediately got suspicious. Eight Turkish Lira Fifty. That’s £4.25. For TWO TEA BAGS AND A SMALL JUG OF MILK? Pity the poor room service chappy who couldn’t understand quite what I was getting worked up about. I was charming, as ever, but I was a little riled. I immediately leapt for the phone and dialled room service. “If you didn’t want to be charged you should have asked for a tea and coffee maker, sir, ” came the effecient and (in her defence) accurate response. Very helpful. Bless them all here. They do have the holidaymaker from hell to deal with.